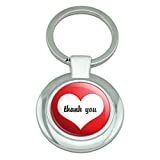 This sturdy round keychain is the perfect keeper for your collection of keys. The chrome plated metal has a solid, quality feel to it. The design shown is coated in resin to protect it from wear.